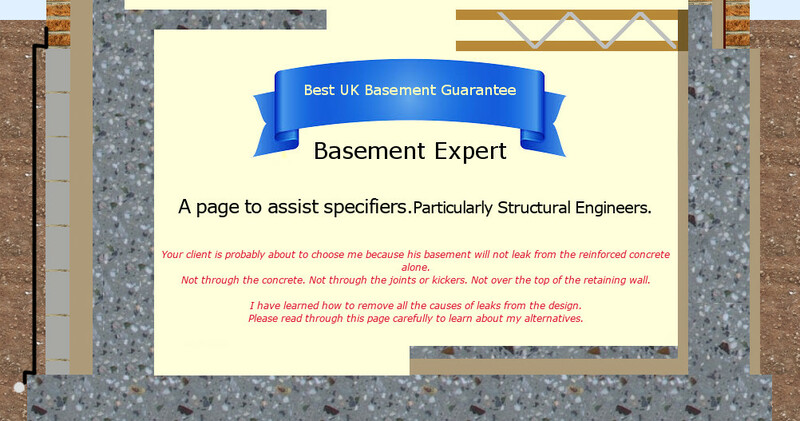 Page for Structural Engineers about to design a basement for a client who wants to self build my way. My name is Phillip Sacre. I have been building and helping to build basements for years. I sell my expertise to self-builders and some products I sourced because they are better than the famous brands. You might be here because your client has asked you to read this page so you understand where he is coming from, trying to influence your design. 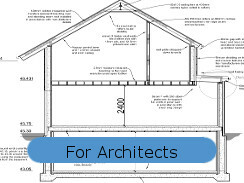 Rather than repeat ourselves, could you please look through the page for architects as well. There you will find information on these 4 topics. Basement waterproofing. Clients don't want what specifiers want. The truth about waterproof concrete. How a floor over a basement is different to a normal house. Door and window openings in a waterproof concrete wall. Pumping foul waste from a basement bathroom, toilet or laundry. Extra steel to restrict crack widths in concrete that gets hot. Room to properly place concrete and capping bars. Why wall kickers could never be waterproof. I have a lot of experience making sure that waterproof concrete stays waterproof as it cures. I have found that slabs do not crack when cooling. I presume because the edges are not restrained and the slab as a whole can shrink. I have never seen walls crack horizontally, presumably because they can shrink in height unrestrained. Cracking is regular and vertical in walls. Not quite to the bottom where there is extra crack protection from starter bars. Nor right to the top of a wall, presumably because walls are restrained at corners but even corners give a little at the top of a wall. This is typical of a crack where there is not enough distribution steel and the ends of the walls are restrained. A 300mm thick wall with A393 and 12mm starter bars on 200mm centres in both faces will crack like this and may not fully heal, whereas the same steel in a 200mm thick wall seems to always heal completely. We all want any crack to heal before we backfill, to heal before water could flow through and prevent the autogenous healing process. In 250mm thick and 300mm thick retaining walls more distribution bars and thicker starter bars seem to provide the solutions. 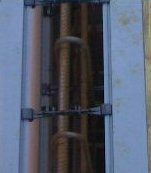 Extra distribution bars horizontally in the wall between the A393 horizontal bars, meaning 10mm bars on 100mm centres to both faces. Half of you claim corners are a weakness and specify corner bars in 3s on 200mm centres. The other half claim corners are the strongest part and don't specify any corner bars. I never had one crack but we should have full crack protection. Corner bars and the extra distribution bars. Bars in threes make concreting with a pipe a bit harder and threes should only be needed on reverse corners. Most basement corners should be fine with only 2 corner bars. Only the A393 bars need connecting with corner bars. I don't think that the extra distribution bars need corner bars as well. They might overlap by 20mm but their work is along the wall, not at the ends. 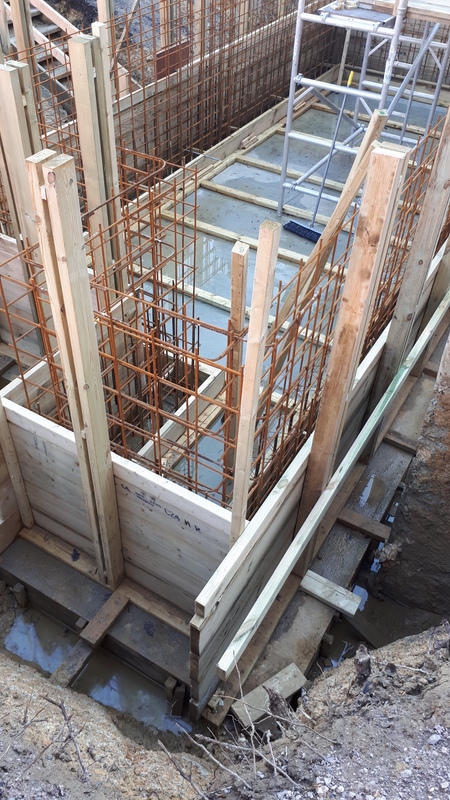 An apparent advantage of a concrete floor over rather than engineered timber would be the support a concrete floor gives to the top of the retaining walls by propping the walls one side against the walls the other side and the backfill beyond. But this would mean that the floor had to be in place and complete before the basement was backfilled and that causes safety problems. It might also mean that internal basement walls had to be complete before the floor over could be installed. Delaying backfilling still further. If you look on the page for architects, the upstand to the retaining wall is essential. An engineered timber floor works with the upstand far better than pre-cast concrete. The extra steel required in 250mm or 300mm thick waterproof concrete is often sufficient for the wall to just be cantilevered. Trying to save the client money by specifying walls only 200mm thick costs the client money by the time you also specify a precast concrete floor and screed to overcome the curvature of precast beams. 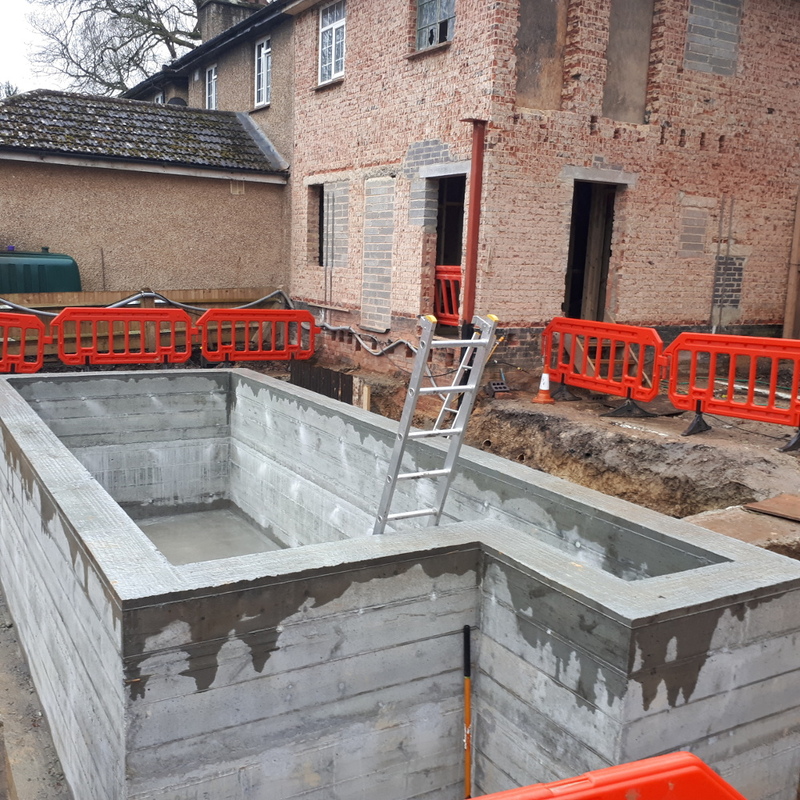 Also the client would need a service void under a concrete floor so the whole excavation needs to be deeper and the walls taller, costing more as well. Please see the architect page for a full discussion. Room to properly place and compact concrete. "Design, including design for durability, construction and use in service should be considered as a whole." Your design has to allow, not prevent, the required standard of workmanship. There must be room to get concrete to the bottom and compact it properly. Some engineers like to see capping bars all along the top of a wall and, sometimes, even a central distribution bar. 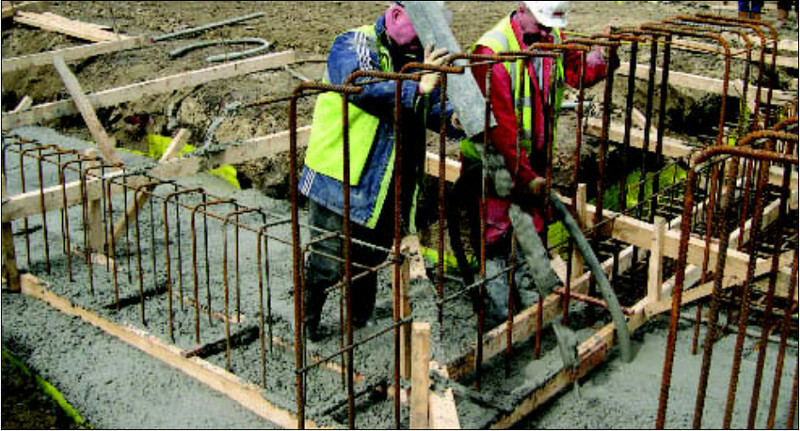 Concrete cannot be poured through a tube to the bottom or properly compacted with a vibrating poker with this amount of obstruction. In contrast, we like to have the same bar Shape 21 on 1.2m centres both horizontally and vertically throughout the wall (1m from the slab and 2.2m from the slab) to control the space between the steel and keep it all perfectly upright throughout, not just along the top which would leave the middle to curl and wave without control. Neat steel gives everyone confidence. 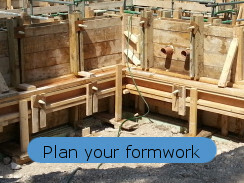 Not having U bars along the top allows us to move the concreting pipe along the wall formwork without taking it right out every time - which greatly reduces the mess from concrete dribbling from the tremmie pipe. Not having U bars along the top means that the poker does not have to be pulled right out of the wall every 200mm before it is lifted back in to do its next bit of compaction - reducing the amount of work the man on the poker has to do considerably, so the compaction is carried out better without a top line of U bars. The biggest enemy of waterproof concrete has to be a kicker, a small upstand on the slab to clamp traditional formwork to. In this photo you can understand why the concrete in the kicker sinks into the slab if the concrete is compacted properly with a vibrating poker. Therefore, kickers end up getting made out of old concrete already setting or the wrong mix bought in for something else. This poker is obviously being allowed to dwell in one place too long. This will knock the largest stones away first and eventually the sand as well so that when the poker is withdrawn there will be just a column of water through the concrete. 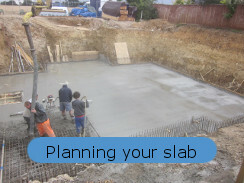 If the kicker was made after the slab was set, you have an extra joint to scabble and clean first but the poker would send the kicker concrete flying because a poker is too powerful for concrete only 100mm deep. More discussion and solutions here. This photo is from a BBA certificate for a water-resisting admixture. As a practitioner, I think this supplier, and I presume BBA as well, are absolutely clueless. This is a basement built my way, without kickers. A building firm saw a self builder's basement. Studied these web pages then placed their order. 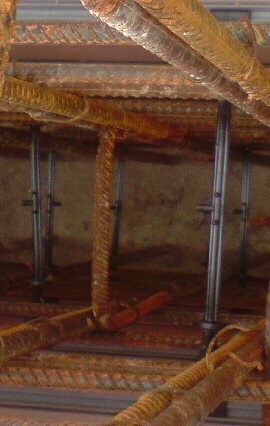 I took this photo when I delivered the FRP threaded rods and nuts.